Is it just me, or have there been a huge number of broken bats this season? 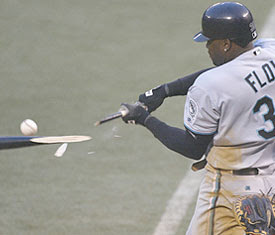 It seems like four or five times every game, bats are shattering and pieces flying all over. I mentioned this earlier in the season and at the time I attributed it to the colder weather. But it just keeps happening. This is something that Major League Baseball will do absolutely nothing about, until someone gets seriously hurt and then everyone will say that they ought to do something about that. I will say I told you so. Global Warming has effected the wooden bat. this was posted in 2008 and here we are in 2012 and there were 3 bkn bats in last nite's ORIOLES/YANKEES game..ALDS...(game 4) looks like still no answer to your question...scary!